Forsyth County is one of the North Carolina counties that has scheduled a revaluation for 2017. Notices of valuation were thought to be forthcoming to all property owmers around the middle of February. 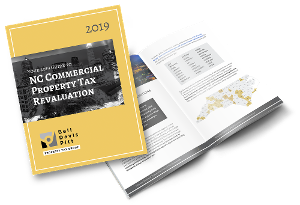 If a property owner is dissatisfied with the valuation of its property for property tax purposes, it must follow a specified appeal process to contest the value and attempt to get it lowered. The first step in this appeal process is the local appeal, typically to the county Board of Equalization and Review [BER]. Deadlines for local appeals vary from county to county and from year to year, but are always sometime between April 1 and June 30. In a recent post, we mentioned that North Carolina counties are required to revalue all real property at least every eight years, although some do it more frequently, generally on a 4 year cycle. We also mentioned the twenty or so counties that are scheduled to revalue in 2017. 2017 looks to be a busy revaluation year in the Triad as several counties in the Triad are scheduled for a revaluation. We previously mentioned details regarding the revaluation in Forsyth County. In a recent post, we mentioned that North Carolina counties are required to revalue all real property at least every eight years, although some do it more frequently, generally on a 4 year cycle. We also mentioned the twenty or so counties that are scheduled to revalue in 2017. 2017 looks to be a busy revaluation year in the Triad as several counties in the Triad are scheduled for a revaluation. We previously mentioned details regarding the revaluation in Forsyth, Guilford, and Alamance counties. In a recent post, we mentioned that North Carolina counties are required to revalue all real property at least every eight years, although some do it more frequently, generally on a 4 year cycle. We also mentioned the twenty or so counties that are scheduled to revalue in 2017. 2017 looks to be a busy revaluation year in the Triad as several counties in the Triad are scheduled for a revaluation. We previously mentioned details regarding the revaluation in Forsyth and Guilford Counties.